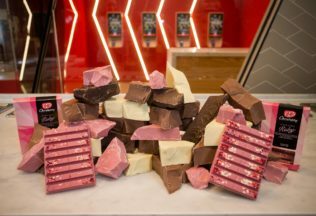 KitKat Chocolatory by Nestle is giving Australian chocolate lovers their first ever taste of Ruby – the world’s only new chocolate variety to be launched in 80 years. Available exclusively at KitKat Chocolatory, Ruby is the fourth type of natural chocolate after milk, dark and white, and features an all-natural pink hue, berry flavour and a smooth texture. The chocolate will be showcased in Australia in two limited release creations – KitKat Chocolatory Sublime Ruby and handcrafted KitKat Chocolatory Black Label Ruby. The process was developed by Barry Callebaut, one of the world’s largest cocoa producers. “Ruby’s colour is a result of an innovative production process which unlocks the distinctive flavour and colour tone naturally present in the beans” a Kit-Kat spokesperson said. KitKat Chocolatory Head Chocolatier, Connie Yuen, said Ruby represents an exceptional discovery in the sweet world. “We are delighted to be launching Ruby chocolate and believe Australians are going to love it. Our iconic batch baked KitKat wafers form the perfect base to complement Ruby’s naturally occurring fruity notes,” said Yuen. “Since opening our doors, we’ve delighted thousands of guests with our unique creations and we look forward to doing so once again with our Ruby offerings,” she said. KitKat Chocolatory Sublime Ruby offers a crisp batch baked wafer finger covered with premium Ruby chocolate, while KitKat Chocolatory Black Label Ruby is carefully crafted in store. The eight-finger bar is smothered in Ruby chocolate and topped with sweet dried strawberries, raspberries and caramelised meringue. Sandra Martinez, Nestlé Oceania Market Head, said that the breakthrough innovation of Ruby chocolate showcases Nestlé’s continued commitment to developing stand-out new products to help grow its international confectionery brand worldwide. “We are proud that KitKat Chocolatory is the first brand to offer chocolate lovers a taste of this new chocolate variety. We’ve secured the exclusive rights to be the first to launch Ruby worldwide, leveraging Nestlé’s speed and agility in innovation. KitKat Chocolatory ‘Sublime Ruby’ and KitKat Chocolatory Black Label Ruby are available exclusively at KitKat Chocolatory in Melbourne Central, and via Click & Collect at shop.kitkat.com.au. Sublime Ruby is being sold at the recommended retail price of AUD $5 and the Black Label Ruby at the recommended retail price of AUD $20. Food containing low-THC hemp can now be sold in Australia.